My goal is to read the shortlist before July 18th, the day of the 2018 Award Ceremony. Anyway, enough rambles, here is my review of Borne by Jeff Vandermeer! Flying bears, sentient plants, modified children with insect eyes and magicians. Nothing grows in the City and what’s alive is only trying to kill you. Welcome to Borne, the last Jeff Vandermeer book. Set in a world where Earth is completely ravaged by humanity, Borne follows Rachel, a scavenger. When she is not climbing on a sleeping Mord, a giant flying bear who terrorizes the City, trying to find useful things that she can eat, trade or give to her partner, she spend her time making traps to protect her home. Her days are all the same until she finds a tiny plant living on Mord. Just in case it can be of any use to her partner Wick, a former scientist turned drug dealer when everything fell apart, she decides to take it home. She is oddly drawn to this plant, and against Wick’s will, she decides to keep it and to name it Borne. What she doesn’t know is that, for a plant, Borne is oddly talkative. And that he can also move. And shape-shift. And the worst thing is, that in this world, it’s not actually that crazy. But what is exactly Borne? Who made him and for what purpose? Is it the mysterious Company, a biotech company which created Mord or does it come from somewhere else? And does it even matter to our protagonists ? In several aspects, this story is oddly heavily inspired by epic fantasy. Those fantastical elements make interesting contrast with the climate fiction nature of the book. First of all, a battle between two sides is tearing the city apart and Rachel, Wick and Borne are trying to survive it. This battle is between the Magician, a strange woman surrounded by an army of disfigured mutant children and Mord, a peace of biotech gone rogue. But it is also humanity versus nature and humanity versus the consequences of their mistakes. However Borne is not a story about heroes making war but about the lives of people who are living through it. Our protagonists want nothing to do with the Magician, they are just trying to live another day, to scavenge another thing and not to think too hard about the future. Since the entire story is set in a nameless city, we don’t have any perspective on how the world is outside. Indeed for the characters, this city is their entire world, and, when you a trying to survive, you don’t have time to think about the scope of your immediate problem. We, as readers, have to assume that this situation is representative of the fate of humanity. Borne has a feeling of nostalgia, of a lost childhood and a lost Earth. Nature is uncomplying and completely rejecting humanity. When they are not scanvenging old cans, the city inhabitants take Wick’s drugs or alcohol capsules. Those drugs can make you relive happy memories and forget about your miserable life. It allows humans a short reprieve from Earth rejection. Borne is here to confront our protagonists to this world. For him, even if Earth is deadly, it is still beautiful. And that’s the beauty of Borne: where Rachel and Wick only see destroyed things, he sees potential, beauty and life. He completely deconstruct their vision of the world and of themselves. Through Rachel’s eyes, we see the world as it was before and how it all went downhill. However, Borne’s perspective is way fresh, innocent and child-like. He is an endless source of interrogation because he is not indifferent to the world. His sometimes very naive and simple statements are delightful in contrast of the grim and heavy atmosphere of the city felt by the characters. Borne is a slow book, the plot takes time to unflod itself and for me this book is much more about the journey and the characters than the story. It is a study of love, motherhood, nature and humanity conflicted relationship with environment. This book begs to be savored. In a way I found it quite comparable to The Book of Strange New Things by Michel Faber as I found overlapping themes and a same sense of atmosphere between the two works. While Borne is a slow book with dark themes, it manages not to be depressing mainly because of how bubbly Borne is. Even when we learn more about his origins and his purpose, I couldn’t help but to really like his characters. His constant reflexions on what is a person and on Earth’s beauty were a real treat. All in all, I would highly recommend Borne, it is a very odd read but I found it relevant and thought-provocking. I am glad it was shortlisted for the Clarke as it is clever and not that depressing for a post-apocalyptic book (which is a rare thing indeed!). Set in the aftermath of a continental civil war, Disco Sour follows Bastian, a member of the Federation, an European network that holds the world together. In the opening scene, we learn that Bastian was dumped through the Breakupshop®, an app that sends you a notification when you are dumped while blocking all information about your former partner so that you can’t contact this person anymore. While being dumped is never nice, being dumped through an app is even worse. Devastated, Bastian drinks a bit more than he should a few nights before the most important event of his carrer. Indeed, he has to present the last important project of the Federation, a project that should change the way young people interact with political parties. However, to do so, Bastian has to fly to Chile. The only problem is that, when he wakes up, he is without his Morph phone and very much late to catch his plane. He can’t contact his colleages and he is stuck on the wrong continent. I have mixed feelings about this book. I was very impressed by a couple of things and quite let down by other but let’s start with the positive. The worldbuilding was fantastic and very detailed which was especially impressive considering how short this book is. We slowly learn about the civil war, how it came to be and how it completely reshaped the world. Through Bastian’s quest to reach the conference in Santiago, he jumps from airport to airport and we are able to see the repercussions of the war in different States. Countries are shattered in economic zones, Paris isn’t part of France anymore, it is now P.A.R.I.S.®, an independent area completely closed off from the rest of the country. I found those parts of the book fascinating, especially when it focused on the succession of events that led to the start of the conflict. It felt believable and well-researched. I also liked to see how the economy and the technology evolved. In this vision of the future, everything is trademarket and almost every interaction is made thanks to apps (even breakups!). Even traders use a Tinder-like app to make financial transactions. So I found the worldbuilding very successful and engaging. However, even if I enjoyed that aspect, I didn’t connected with this book for a couple of reasons: I had issues with the main character, the plot and the overall writing. First of all, from the start I couldn’t empathize with Bastian. I found him whiny, very naive and quite childlike. I get that being dumped isn’t nice but he spends way more time thinking about his former partners than about the issues at stake. He is also always horny, and, even when he is in the middle of a important speech, he still manages to be active on Tinder… I just couldn’t bring myself to like him, he couldn’t mention something without linking it to one of his ex. I also couldn’t picture him as the leader of a serious political organization since for me he acted like a teenager. If I were one of his colleages, I would probably despise him. We learn a bit about one of his co-workers, Sandra, and even if she appeared on less than 10% of the book, I found her to be a way more complex character. I would have loved her to be the main character because she does all of the cool stuff in this novel. However, I could have looked past Bastian if the plot was interesting but sadly, I found the whole story a bit boring and, if I am honest, quite random. I keep on waiting for the moment something would finally happen but apart from the endless struggles at various airports when he is supposed to save democracy, nothing really happens. Because of that, the resolution felt 1) too easy and 2) absurd. So yeah, I can’t really recommend this book, the worlbuilding was terrific but I found the rest lacking. To be honest, I would have preferred this book to follow the event of the war from different perspectives all around the world. This would have been a fantastic story and if Porcaro is writing that next, I will be reading it! The author send me a copy of this book in exchange for a review. All opinions are my own. I am glad to say I got two books right! I was almost certain that Borne would be on this list after reading it last month and I had a gut feeling that Sea of Rust would also be present after all the buzz around it last year. I considered American War for my predictions but I thought that it might be considered more a literary fiction more than SF. However after reading the synopsis, it does definitely “sounds” more SF than any other genre. And even if it weren’t the case, it wouldn’t have mattered too much anyway since The Underground Railroad won last year and this work is seen as more of a lit-fic book than SF so… But we could have a nice chatn about what is SF and where does it end. In my opinion, this distinction between genres is blurry, if it even exists at all (the number of books considered mainstream or literary fiction using speculative fiction elements being huge). Spaceman of Bohemia is also a title that I am not suprised to see on this list, it does sound like an interesting work: it follows a Czech astronaut on a solo mission on Venus. However, I probably wouldn’t have picked it up if it wasn’t for the prize as I have read mixed reviews from fellow bloggers last year. The cover is a stunner though. As for the two remainings titles, they are complete discoveries, I never heard about them before. I believe Gather the Daughters is a debut set in a dystopian world where women’s are only there to serve men. It’s giving me The Handmaid’s Tale vibes. As for the last one, Dreams before the End of Time, I only know that it was shortlisted for the BSFA. According to the synopsis, it is a family saga set in a near-future London. This list is very interesting to me, first of all because a lot of works seem to be “missing” which is an odd feeling. However, because this list is so suprising, it makes it more exciting. I want to see what makes those particular books more unique to the eyes of the judges than the books I thought would be there. Of course, lists are based on personal choices but also on the ability to find and read a book. For the Clarke, judges are sent more than a hundred books, which means that their possibilities are way different than mine. As readers we are probably more biaised toward certain titles: titles from author we heard about before or that are marketed very well. For example, I only read one book in the shortlist and it is from a very well know author: Jeff Vandermeer. I heard a lot of good things about it last year from other bloggers, the cover is amazing, it made a lot of “Best of” lists etc… Lots of factors enclined me to pick up this book. It’s not to say that the content isn’t great because it is, this book is fantastic, but still. So I am very excited about this list, especially about the two works I never heard about before. So much so that I don’t even know where to begin… I already read Borne so my review will be up soon but I don’t know which book I will read next! Even if I only managed to read two things, both works were very good. 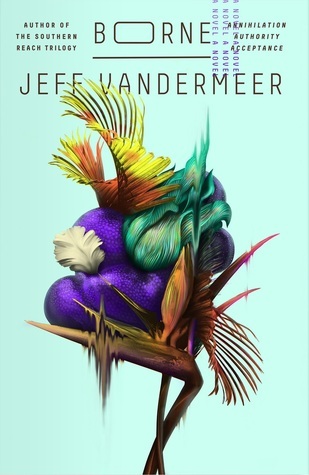 My favorite is Borne by Jeff Vandermeer and my review will be up soon. I’m so glad to see it shortlisted for the Clarke, it deserves its spot! Since I don’t know how much I will be able to read this month, I won’t make my plans too ambitious. 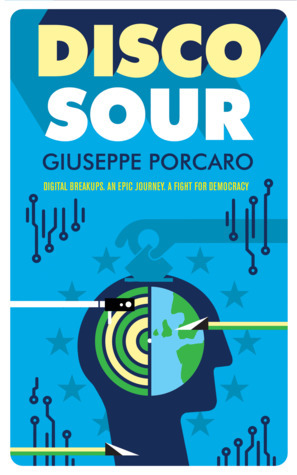 I want to read and review Disco Sour by Giuseppe Porcaro since the author was kind enough to provide me with an ARC. I would also like to start my 2018 Clarke Shortlist Reading Project but I will make another post about it in a few days!